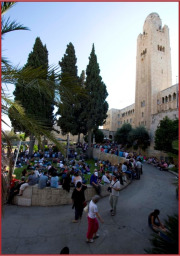 The Jerusalem International YMCA has been serving the people of Jerusalem for over 133 years, facilitating peaceful coexistence between its communities. For over eighty years the YMCA building has been a meeting ground and conference center for people from all backgrounds and nationalities, coming together to discuss issues of shared concern. The YMCA is a safe haven in this complex region. Here people of all ages gather together in peace, connect with neighbors and participate in life-changing activities that help them grow in spirit, mind and body. The YMCA celebrates what unites us rather than what divides us. Through youth programs, arts, social events, sports, wellness, tourism and more, the Jerusalem International YMCA provides a model for how diversity strengthens us all. The future can be different because of what is happening at the Y today.